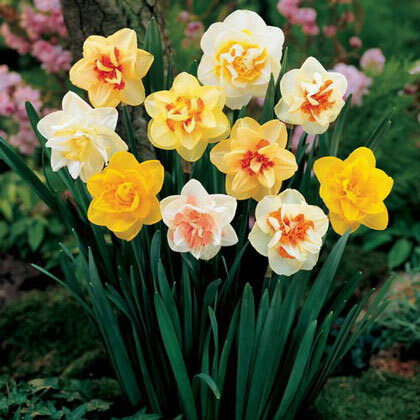 Double Daffodil Mix | Gurney's Seed & Nursery Co.
Delightful double blooms up to 4 in. across make an impressive display in mid spring. Includes a mix of varieties, all strong, long lasting and never bothered by deer. Grow 15-20 in. tall. Zones 3-9. 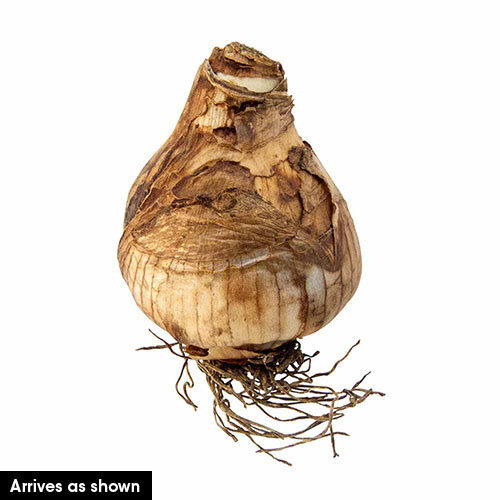 14-16 cm bulbs. Height12 - 20 inches; varying heights. FoliageGreen, long, slender strap-like foliage. Flower FormDouble blooms. Mild fragrance. ColorMix of yellow, white and orange double blossoms. BloomsMid spring for about 2 - 4 weeks. Growth RateModerate growth rate. Bulbs will grow and bloom the first growing season after they are planted. PruningDead-head. Allow foliage to die back. CommentsWe've captured the beauty of one of the most popular dutch flowers in this exciting mix. Each variety of daffodil exhibits a double center to each bloom in bright yellow, creamy white, or vivid orange. Planted together they make a quite a color show for ayour garden or landscape in springtime. You can also enjoy indoors in a cutflower arrangement. SizeUp to 4 inch blossoms.